Audio quality is critical when it comes to video production. On-camera shotgun microphones are an easy way to up your audio quality when recording with a DSLR video camera. Another benefit is that they don’t have to be mounted to the camera, you can get an extension cable and mount them on a boom pole or tripod to get the mic closer to your subject. If you’re interested in other options besides shotgun mics for interviews, take a look at these interview microphones. Rode has several different on-camera microphones. We’re just looking at the directional shotgun style mics for film, but they also have a line of Stereo VideoMic’s. It can be confusing to understand which one to get, so we’ll try to simplify it for you. The following 5 microphones are in descending order of price, quality, and features, from highest to lowest. The first 3 require a battery but have some very useful features for getting great audio quality. The last 2 don’t use a battery and are always on. Another big difference is how much bass the mics pick up. The VideoMic Pro and VideoMic both have 40Hz – 20kHz frequency response, while the VideoMic GO and VideoMicro have 100Hz – 16kHz response, lacking that extra low-end pickup. I also want to highlight a useful accessory that Rode recently updated: The VXLR+ is an update to the VXLR. It’s used to convert a 3.5mm minijack (that’s what all the VideoMic’s use) to a 3-pin XLR connection for use in devices like high-end video cameras, field recorders, and USB mixers. You can use the VXLR+ with Rode’s wireless lav and headset mics as well. Auto power on/off (yes!) with a detachable cable. The low-end pickup range has been increased from 40Hz to 20Hz, you get a 2-stage high-pass filter at 75Hz or 150Hz, and selectable gain options for -10dB, 0dB, or +20dB. The detachable cable means you can easily swap out a longer cord for use on boom poles or larger mounts too, making this very flexible. Rode really listened to their customers on this one and definitely delivered. This is a must-buy if you want the best. 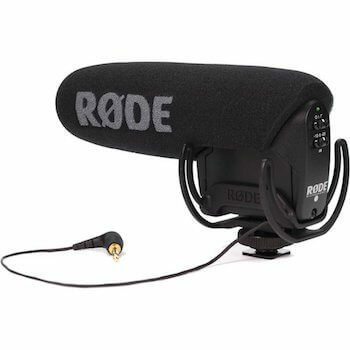 The Rode VideoMic Pro is a great on-camera shotgun mic that gives you a ton of flexibility. 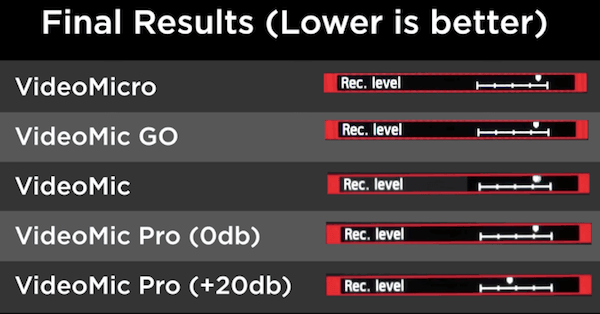 The standout feature on the Pro model is the +20dB level boost, allowing you to get cleaner audio from farther away. It also has a 0dB and -10dB setting, a flat and 80Hz high pass filter, and very low self-noise. The integrated Rycote Lyre shock mount is the best out there. Another big benefit is the position of the mount and the back of the microphone allow you to use the eyepiece on your camera with the microphone attached to the shoe. It doesn’t stick out behind the camera. Rode has an amazing deal with the VideoMic. For an extra $6 or so, you get the On Stage MBP7000 boom pole, mic screw adaptor, 25-foot extension cable and a windshield. The boom pole itself runs $35-$40, so it’s a no-brainer to get the Rode VideoMic Pack over just the mic itself. 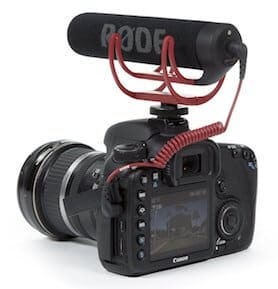 As for the features of the VideoMic, it has Rycote Lyre shock mounting, 80Hz high pass filter (to get rid of things like car noise or HVAC systems), -10dB and -20dB PAD, and records from 40Hz to 20kHz. The noise level is very low too. The VideoMic GO doesn’t need a battery, which means you can just plug it in and GO. This can very useful for convenience (or if you don’t want to worry about turning the mic on and off). FYI: the description on Amazon is wrong and is actually for the VideoMic Me. It is meant to be used with a DSLR camera. The Rode VideoMicro is the smallest shotgun microphone in the Rode VideoMic lineup. It has a cardioid pickup pattern (vs super cardioid with the other 3 above). Again, no battery is required for this mic and it’s a great choice if you want something that is easy to travel with. It also comes with a furry windscreen, making it a great value. 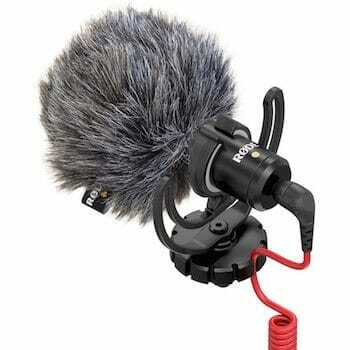 Like all the VideoMic’s, it includes a Rycote Lyre shock mount, but this one is detachable. The TAKSTAR SGC-598 is the best low-budget DSLR microphone – it runs about $30. For that, you get a +10dB boost and a 200Hz high pass filter that runs on a single AA battery. It definitely has a cheaper build and feel than the other shotgun mics and you don’t get a shock mount. 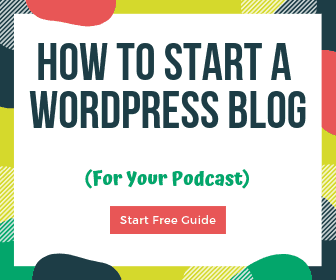 If you want the cheapest option, this is it, but I would suggest trying to raise your budget slightly. 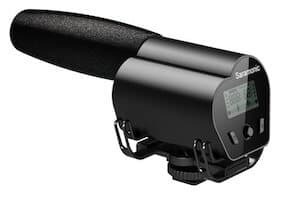 The Shure VP83F LensHopper (the model with integrated flash storage) is one of my favorite camera-mounted shotgun mics for a DSLR, especially if you are not using an external mic pre-amp or mixer. The main reason is the fine boost control that you don’t see on other similar mics – you can change the gain up to +60dB in 1dB increments – allowing you to get the perfect level right on the mic! Having the ability to record with and without a camera opens up your options a ton. It uses AA batteries, has a Rycote Lyre suspension system, and is built to last. The self-noise level is extremely low as well. 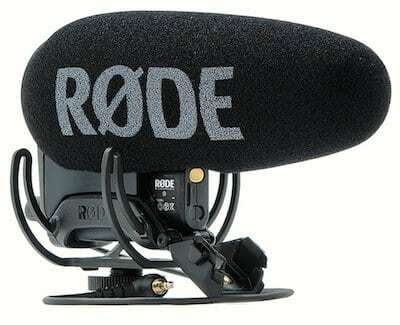 If you’re trying to choose between the Rode VideoMic Pro and this, get this one. 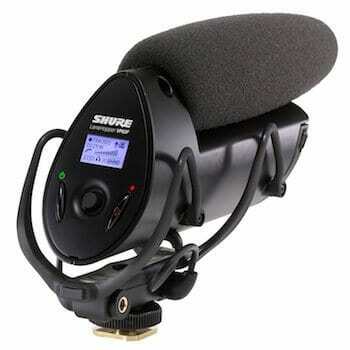 Pair it with the Shure A83-FUR Windjammer for outdoor shooting. What about the VP83 LensHopper? Still an excellent choice for about $90 less. It doesn’t have the same fine boost control (you get -10dB, 0dB, and +20dB) or external recording, but you get amazing sound on a single AA battery. Both mics are mounted and positioned so that you can use the eyepiece without additional mounting equipment. The Saramonic VMIC Recorder is an awesome shotgun mic for DSLRs. The included stereo headphone output allows you to hear what you’re recording in real-time (here are some great headphone options). There are 2 models: one with a flash recorder and one without. The flash recorder model lets you record WAV files to a separate MicroSDHC card and comes with a nice LCD screen. You get -10dB, 0, and +20dB level control, 150Hz high pass filter, and an built-in shock mount. This is an excellent mic with great features for the price in both configurations. The Canon DM-E1 is unique because it is switchable from shotgun mode to 90-degree and 120-degree stereo width. The stereo options make it great for capturing ambiance and live recordings. It’s compact, has an “auto-on” mode, and includes a windscreen. It will pick up frequencies between 50Hz and 16kHz and runs off a CR2032 lithium cell battery. 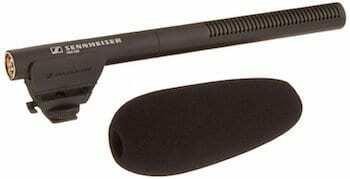 The Sennheiser MKE 600 is excellent for stationary video. If you’re creating YouTube videos or vlogs and don’t need the mobility some of the other mics give you, this is your mic. 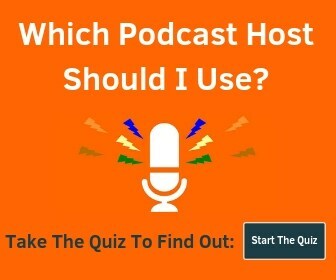 For voice recording (interviews, voiceovers, explainer videos, etc.) this is easily the best choice. 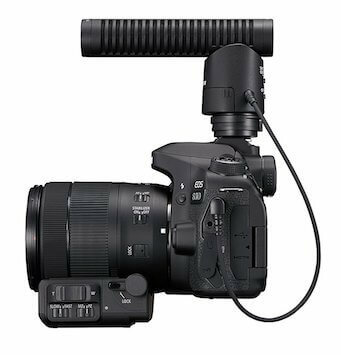 This uses an XLR port, which your DSLR may not have. You can easily get an adapter to plug into the camera. You can also record to an external recorder or computer depending on your needs. Can be used with a battery or 48V phantom power. Want the best on-camera shotgun mic?